Following the funny mistranslations and crazy things PMs have said posts we published recently, it’s time for one more article to lighten up your busy day (and don’t forget; the weekend is almost here!). 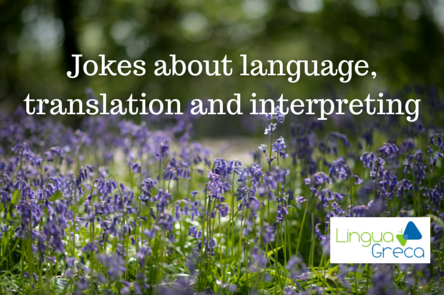 I always wondered if there were jokes about translators, interpreters and linguists in general. Turns out there are quite a few and they are good! I had only heard a few of the ones mentioned below, the rest I discovered during my research for this post. If the translator is a man, HE translates. If the translator is a woman, SHE translates. If the translator is a computer, IT translates. If the translator is either a man or a woman, S/HE translates. Whether the translator is a man, a woman or a computer, S/H/IT translates. A Spanish speaking bandit held up a bank in Tucson. The sheriff and his deputy chased him. When they captured him, and the sheriff, who couldn’t speak Spanish, asked him where he’d hidden the money. “No sé nada,” he replied. A cat is sitting on the throne, and two dogs, an envoy and his interpreter, are standing before him. The interpreter dog is whispering to the envoy dog, “You’ll have to rephrase that. Their language doesn’t have a word for ‘fetch'”. Q: How many translators does it take to change a lightbulb? A: None, they get it changed by a machine, but they still charge for changing the lightbulb as if they had done it themselves. Hahaaha! Saved them to use in future! Hilarious!!! Just had to share these with my followers on facebook and twitter. Giovanni, I live in Israel and burst out laughing after I read it. Thanks. I will try to post this. That was shared in the 80’s a group of Brazilian translators I belonged to. I love not only for the punch line, but for the cultural aspect of it – >> “Right-to-left, moron!” Duh! Hope you had a Happy Pesach. [Allegedly] True Story: An announcement was posted of a Spanish translation of ‘Violators will be fined’. The translation meant, ‘Rapists will be killed’. Whether or not you agree with this idea, the translation was so far off the mark that the signs had to be replaced and the translator was fired – and not from a cannon! Lawyer: Have you got any grounds? Would-Be Divorcé: Yes, an acre and a half and nice little home. L.: No, I mean what is the foundation of this case? W.B.D. : It made of concrete. L.: I don’t think you understand. Does either of you have a real grudge? W.B.D. : No, we have carport, and not need one. L.: I mean, what are your relations like? W.B.D. : All my relations in Poland. L.: Is there any infidelity in your marriage? W.B.D. : We have hi-fidelity stereo and good DVD player. L.: Does your wife beat you up? W.B.D. : No, I always up before her. L.: Is your wife a nagger? L.: Why do you want this divorce? W.B.D. : She going to kill me. L.: What makes you think this? L.: What kind of proof? W.B.D. : She going to poison me. She buy a bottle at drugstore and put on shelf in bathroom. I can read English pretty good, and it says on label: “POLISH REMOVER”! Love the “misinterpretations”! I am still laughing! For those (including myself) who aren’t keen on machine translation: It’s been said that “Out of sight, out of mind” has been translated as “Blind insanity”! When I was a kid, my Uruguay-born neighbor had a Puerto Rican housekeeper; Spanish was the common language that divided them. My neighbor once accidentally cut herself and said, “I just cut myself! Can you get me a bandaid?” The help freaked out — she’d heard “get me a priest”!